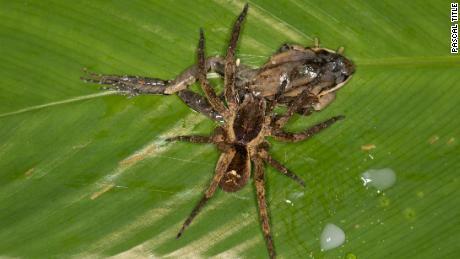 Home Latest US News Huge spider eats an opossum. Scientists excited by find. Huge spider eats an opossum. Scientists excited by find. The spider had grabbed the opossum — a small furry creature known as a mouse opossum — by the neck and it was still twitching when the scientists found the pair. They watched for about five minutes and were able to document the moment on video, before the spider hauled its prey behind a tree root to enjoy its meal in peace. The article titled “Ecological interactions between arthropods and small vertebrates in a lowland Amazon rainforest” documents 15 cases of arthropods — mainly large spiders and centipedes — preying on vertebrates like small frogs, snakes and lizards. “These are not common events to observe, period. Any kind of predation event involving a vertebrate, whether it’s a snake eating a frog or a bird eating a lizard — all of these are very rare,” said Dan Rabosky, a professor of ecology and evolutionary biology at the University of Michigan. He brings a group of researchers to the lowland Amazon rainforest in a remote part of southeastern Peru once or twice a year. His teams are on the lookout for snakes, frogs and lizards during their nighttime walks, but they often see large spiders on the prowl. He said that biologists have probably underestimated how many small vertebrates are killed by large spiders and centipedes. “We really don’t know anything about the ecology of a lot of these animals. It just highlights how little we know,” he said. The paper also documents spiders and a giant water bug killing various frogs and lizards and a particularly terrifying case of a large centipede decapitating and partially eating a venomous coral snake. The spider that killed the opossum had a body that’s bigger than a baseball, and that doesn’t count the legs. The opossum was about the size of a softball. They talked to mammalogists, who said it appeared to be the first documented case of a spider eating an opossum. Grundler was one of the students who saw the encounter and his sister Maggie Grundler captured the video on her phone. They are both co-authors of the paper. It all may seem like nightmare fuel — especially when you’re in the Amazon in the dark, but Rabosky said that’s not the case. “For our group it’s actually the most amazing thing. Everyone is very excited about this sort of stuff,” he said. “That’s the kind of thing that if somebody was like ‘Wow I just saw this!’ everybody would have immediately said ‘Where?’ and they would have wanted to go hike out into the middle of the rain forest in the middle of the night to go see it.